The emergence of the EMF at the ends of the open-circuit consisting of contacts (junctions) of two different semiconductors (conductors) are at different temperatures, a phenomenon called the Seebeck effect. Thermopower in semiconductors can, for example, to observe, using the compound shown in Fig.1 (1- semiconductors). Over the years, the Seebeck effect is not found a use in the energy sector. The situation changed in the thirties of the 20th century, when found out that the thermoelectric properties of semiconductors have far superior properties of metals. Where ΔT = T2 - T1, T2 - temperature of hot junction, T 1 - temperature of the cold. The formula shows why long thermoelectricity found no practical use except for temperature measurement. For metals, the parameters determining the thermoelectric power, such that the efficiency for them does not exceed tenths of a percent. To create a thermoelectric semiconductor elements can be used as a conductivity type and n-and p-type converter in one connecting them appropriately. Single element thermoelectric converters can be represented as shown in Fig. 1. The first thermoelectric generator, in which thermal energy is transformed into electrical phenomena on the basis of thermoelectric power were created in 1941. 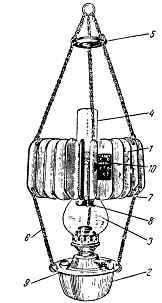 During the Second World War, was used for thermoelectric power radio transmitters. They were simply arranged. For example, dozens of semiconductor thermoelements were mounted in the bottom of a special pot. Bowler has been on fire. The temperature of cold junctions of the elements of the generator wondered boiling water, and heated by the hot bottom of the pot. In the future, and other developed thermoelectric power up to 100 watts or more, and efficiency ≈8%. Thermoelectric not widely used, although used in some areas of technology. Scientists are conducting research to develop materials and structures can take to improve efficiency of thermoelectric and make them more profitable. The appearance of thermoelectric TGC-3 (1953 years).